NEW: Schwarzenegger: Tough cuts were "the only way to solve the problem"
(CNN) -- California's state legislature voted Friday to slash state programs and shuffle around funds to close a $25 billion budget gap that has left the most populous U.S. state issuing IOUs. State Sen. Denise Ducheny and Senate Minority Leader Dennis Hollingsworth discuss the vote Thursday. The state Senate approved the measures early Friday, while the Assembly followed suit Friday afternoon after what one lawmaker called "a horrible mental roller coaster." California Gov. Arnold Schwarzenegger called it "a tough budget, but it's a necessary budget." "I know that college students will pay now higher tuitions," he said. "I know that teachers will be laid off, and I know state workers will get less money. But we have to do that. It's the only way to solve the problem and to save our great state." California faced a nearly $3 billion shortfall for July alone, forcing the state to issue IOUs to some county agencies, state vendors and taxpayers. A deal worked out between Gov. Arnold Schwarzenegger and lawmakers earlier this week includes $15.6 billion in cuts to all parts of government, including schools, colleges, health care and welfare programs. "California has experienced an unprecedented drop in revenues, and we have no choice but to live within our means," Schwarzenegger said. The plan allows California to meet its obligations through the 2010 budget year without raising taxes, which takes a two-thirds majority under California law. But it raises $3.9 billion from increased fees, sped-up tax collections and other revenue-generating measures. Another $3.1 billion would come from money that had been slated to go to local governments -- a step that has cities threatening to sue. The rest would come from various financial maneuvers, such as shifting state payroll entries to another accounting period. "I'm really tired, and I just made one of the hardest votes I've made in a long, long time," Republican Assemblywoman Jean Fuller said. "This has been a horrible emotional roller coaster." Many of the cuts were controversial. One reduces in-home care for the state's Medicare recipients, a program Schwarzenegger said was rife with "waste and fraud." Critics say the measure will result in people who now manage to live at home being forced into nursing homes, and some recipients attempted to use their wheelchairs to blockade the state Capitol in Sacramento last week. But the Assembly rejected two other elements of the 31-bill package. Lawmakers refused to pull about $1 billion in transportation funds for local governments, and rejected an effort to open up a section of the Pacific coast off Santa Barbara to oil exploration -- a plan turned down by state officials in January. Schwarzenegger said he could make up for the defeat of those provisions with cuts his office has the authority to make on its own. The marathon legislative sessions ratified most of a tentative deal struck earlier this week by lawmakers and Schwarzenegger. The Senate approved the package about 6:30 a.m. (9:30 a.m. 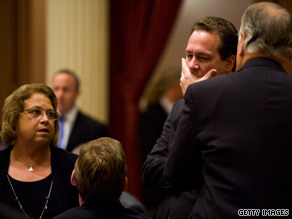 ET) Friday after a debate that started nearly 12 hours earlier; the Assembly followed suit about eight hours later. "The bipartisan solution was the product of several months of negotiations and public hearings on how to address the historic downturn in the economy by responsibly cutting all areas of government while keeping the state's social service safety net intact," according to a statement issued by the office of the Senate's Democratic president pro tem, Darrell Steinberg. California is not alone in its budget difficulties. At least 12 states and the District of Columbia are confronting gaps totaling $23 billion in budgets already adopted, according to a late June report from the Center for Budget Policy and Priorities.